When something happens to you which is in your favor, do you think “I’m lucky!” Or perhaps when another person in your life gets something you desire, you think “She is just lucky.” What is luck? Why do you believe you are lucky when something happens you like…or you are unlucky when something happens you dislike? Being lucky is non-active word. It means you believe you or another hasn’t worked to achieve success; or someone does not deserve a windfall; or they are another are unworthy. Everything which happens to us is for a reason. So, luck has nothing to do with it. If you consider someone unlucky because they are born poor, or someone lucky because they are born wealthy, it doesn’t consider the reason for that person. The poor person may need to learn to work harder. The rich person may need to learn how to share. What is important is what blessings they have worked for to attain the lessons and healing they were born to do. 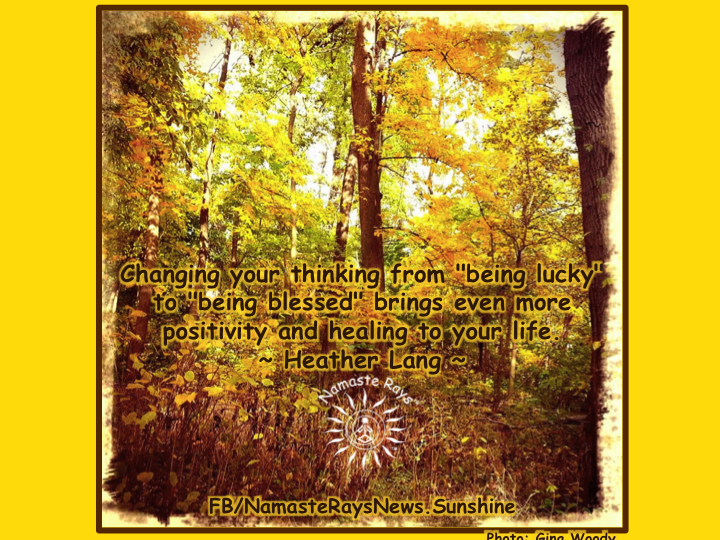 Changing your thinking from “being lucky” to “being blessed” brings even more positivity and healing to your life. Consider changing your mindset from “Being lucky” to “Being blessed”. Being blessed is more active. Thinking someone is blessed or you are blessed is a more active thought process. It’s a more loving, compassionate mind-set. Because when we think we are blessed, we are more grateful for what has happened to us or to another person in our lives. When thinking “blessings”, we acknowledge we have done something positive to receive the person, situation, object, etc, that has entered our lives. Thinking in terms of blessings is also positive thought energy. When we cultivate our positive thoughts, more positivity is attracted to us. Simply being positive is a blessings, as it brings us more to be grateful for in our lives. This is a way to manifest in your life exactly what you desire and what you need. Thinking in terms of blessings also considers the lessons we need to learn and how we need to learn, for both the good and the challenging are blessings. May you create healing in yourself by sending energies of blessings with your thoughts. Love it! It’s so true! I am going to do this! My dad has said that, so i liked your comments too. Thank you Celia! He must be quite a positive man! Namaste!